Mealworms are the larvae of two species of darkling beetles of the Tenebrionidae family, the yellow mealworm beetle (Tenebrio molitor Linnaeus, 1758), and the smaller and less common dark or mini mealworm beetle (Tenebrio obscurus Fabricius, 1792). Mealworm beetles are indigenous to Europe and are now distributed worldwide. Tenebrio molitor is a pest of grain, flour and food stores, but often not of much importance since populations are quite small (Ramos-Elorduy et al., 2002). Mealworms are easy to breed and feed, and have a valuable protein profile. For these reasons, they are produced industrially as feed for pets and zoo animals, including birds, reptiles, small mammals, batrachians and fish. They are usually fed live, but they are also sold canned, dried, or in powder form (Aguilar-Miranda et al., 2002; Hardouin et al., 2003; Veldkamp et al., 2012). The life cycle of Tenebrio molitor is of variable length, from 280 to 630 days. Larvae hatch after 10-12 days (at 18-20°C) and become mature after a variable number of stages (8 to 20), typically after 3-4 months (at ambient temperature) but the larva stage can last up to 18 months. 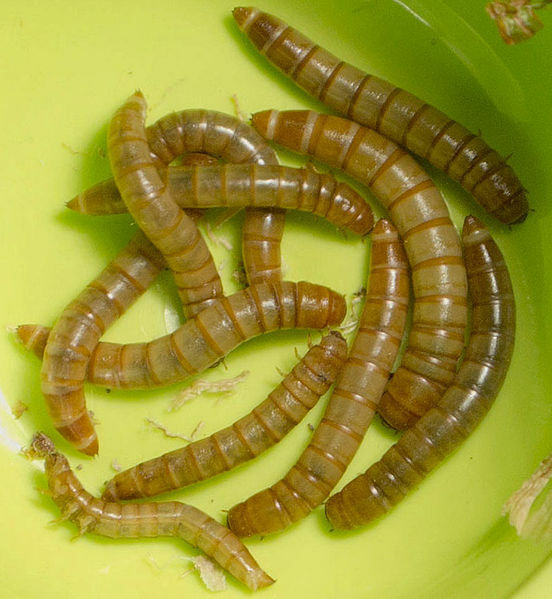 The mature larva is of a light yellow-brown colour, 20 to 32 mm long, and weighs 130 to 160 mg. Commercial mealworm producers sometimes include a juvenile hormone into the feed to prevent the larvae from molting into adults, resulting in "giant" mealworms that can achieve a length of 2 cm or more, and weigh more than 300 mg (Finke, 2002). The pupal stage lasts 7-9 days at 25°C and up to 20 days at lower temperatures. The adult Tenebrio molitor lives for 2 to 3 months. The life cycle of Tenebrio obscurus is shorter, particularly in the larval stage (Hill, 2002; Hardouin et al., 2003). Mealworms are omnivorous and can eat all kinds of plant material as well as animal products such as meat and feathers (Ramos-Elorduy et al., 2002). They are typically fed on cereal bran or flour (wheat, oats, maize) supplemented with fresh fruits and vegetables (carrots, potatoes, lettuce) for moisture together with protein sources such as soybean flour, skimmed milk powder or yeast (Aguilar-Miranda et al., 2002; Hardouin et al., 2003). The diet should be balanced to contain about 20% protein (DM basis) (Ramos-Elorduy et al., 2002). Mealworms are able to utilize the small amounts of water contained in dry feeds but the productivity of water-deprived mealworms is low (one generation per year). It is preferable to provide them with a source of water for better productivity (up to 6 generations per year) and to prevent cannibalism. Relative humidity is linked positively with fertility and adult activity. It is necessary to monitor fresh feeds as they may turn mouldy (Hardouin et al., 2003). 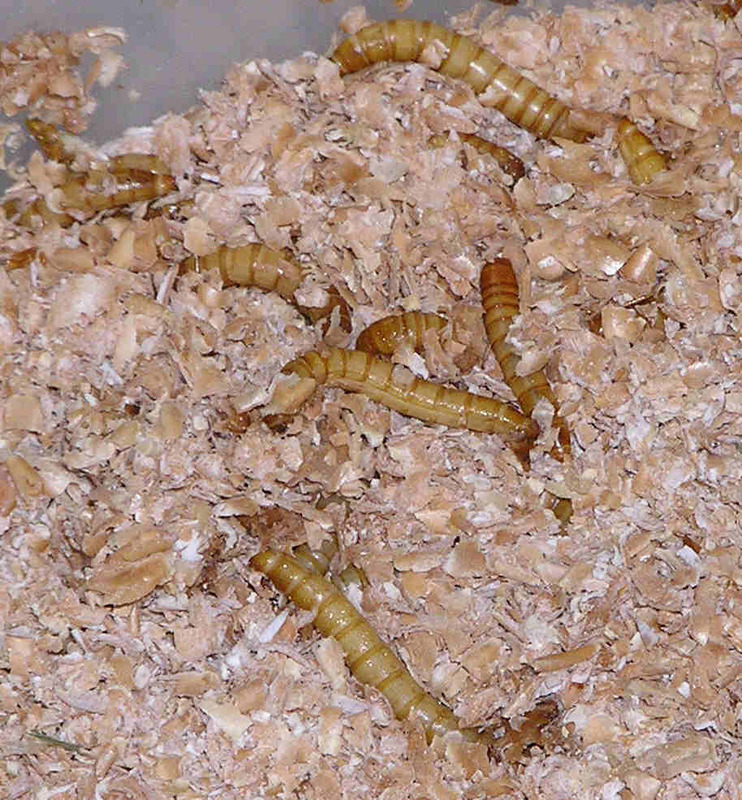 Mealworms are typically fed live but canned and dried larvae are commercially available. In feeding experiments, larvae have been dried at 50°C for 24 h (Klasing et al., 2000); 3 days (Ramos-Elorduy et al., 2002); dried at 100°C for 200 min (Wang et al., 1996); dried in the sun for 2 days (Ng et al., 2001); or boiled in water for 3 minutes and then oven-dried at 60-100°C (Aguilar-Miranda et al., 2002). Mealworms have the ability to recycle plant waste materials of low quality into high-quality feed rich in energy, protein and fat in a relatively short time. Meaworms are a high quality feed. They contain large amounts of protein (45-60% DM) and fat (30-45% DM). Fresh larvae contain about 60% water. They are relatively poor in ash (less than 5% DM), and like other insects they have a low calcium content and a very low Ca:P ratio. The exclusive feeding of mealworms caused Ca deficiency and symptomatic metabolic bone disease (Klasing et al., 2000). It must be noted that composition is highly variable and influenced by the diet. Notably, the calcium content can be manipulated using Ca-fortified diets. Mealworms have been shown to be able to detoxify zearalenone by partly metabolizing it to alpha-zearalenol. There was no risk of zearalenone accumulating in mealworm larvae to such an extent that they could affect animals that ate them (Hornung, 1991). Inclusion of dried mealworms up to 6% in weaning pig diets was found beneficial as it increased growth performance, feed intake and nutrient digestibility without any detrimental effect on immune response (Jin et al., 2016). Mealworms are a potential alternative protein source in poultry diets, in particular to replace soybean meal or fish meal. The protein quality has been likened to that of soybean meal, but the methionine content is limiting for poultry (Ramos-Elorduy et al., 2002). The low calcium content is also an issue in poultry diets. Dried mealworms included at up to 10% (diet DM) in broiler starter diets was used without negative effects on feed consumption, weight gain and feed efficiency. There was no observed rejection due to texture, palatability or inclusion level (Ramos-Elorduy et al., 2002). In a study with female broilers increasing levels of mealworm meal from 5% to 15% (diet as fed) improved body weight and feed intake but partially worsened feed efficiency. Positive effects on carcass traits and haematochemical parameters were observed, without negative influence on gut morphology and histological findings (Biasato et al., 2017). There is limited information on the use of mealworms in the diets of laying hens. Larvae from Tenebrio molitor and Tenebrio mauritanicus were found suitable for layers (Giannone, 2003). Dried ground mealworms were found an adequate substitute for fish meal (Wang et al., 1996). The calcium content and the Ca:P ratio of mealworms could be increased by feeding them a Ca-fortified diet for 1-2 days. The addition of 8% CaCO3 was found to be suitable. The calcium supplied by Ca-fortified mealworms was highly available for supporting bone mineralization in growing chicks, although it was slightly less available than the calcium from oyster shells (Klasing et al., 2000). Another experiment also reported that short-term feeding of mealworms with a Ca-fortified commercial diet for 72 h resulted in acceptable calcium contents in the next 24 h (Anderson, 2000). Fresh and dried mealworms have been found an acceptable alternative protein source for the African catfish Clarias gariepinus. Replacing 40% of fish meal with mealworm meal (dried and ground) resulted in growth performance and feed utilization efficiency similar to that obtained with the control diet. Catfish fed diets with up to 80% replacement of fish meal with mealworm meal also displayed good growth and feed utilization efficiency. Catfish fed solely on live mealworms showed a slight depression in growth performance but fish fed live mealworms in combination with commercial catfish pellets grew as well or better than fish fed the commercial diet. Live and dried mealworms were found to be highly palatable. Catfish fed mealworm-based diets tended to have significantly higher lipid content in their carcass (Ng et al., 2001). In shrimp Litopenaeus vannamei fed on a diet containing different proportions of mealworm meal (up to 100%) as a substitute for fish meal, the moisture, protein, and ash content of shrimp muscle were not significantly altered but lipid content increased linearly. The fatty acid composition of shrimp muscle mirrored that of the experimental diets: particularly, the absence of long-chain PUFA in mealworms resulted in a linear decrease in C20:5 n-3 and C22:6 n-6 in shrimp muscle with increasing levels of mealworm. However, the n-3/n-6 ratio remained within the human dietary requirements and the use of a mealworm diet for shrimp production was found to be a viable alternative to fish meal (Panini et al., 2017). Hardouin, J. ; Mahoux, G., 2003. Zootechnie d’insectes – Elevage et utilisation au bénéfice de l'homme et de certains animaux. Bureau pour l’Echange et la Distribution de l’Information sur le Mini-élevage (BEDIM), 164 p.
Hill, D. S., 2002. Pests of stored foodstuffs and their control. Kluwer Academic Publishers, 476 p.